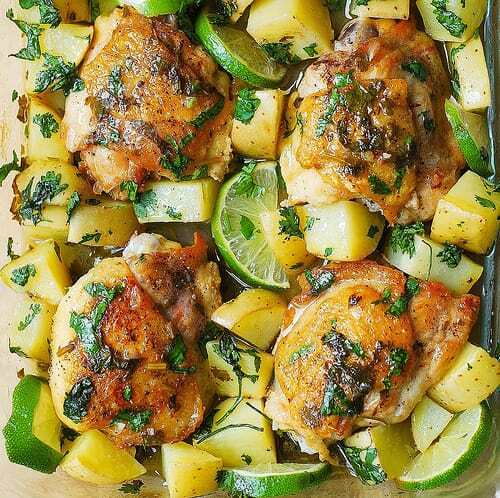 Cilantro-Lime Chicken Thighs and Potatoes baked in the oven in a flavorful sauce made with olive oil, garlic, cilantro and freshly squeezed lime juice! Easy and quick recipe. Great flavor to use with chicken. 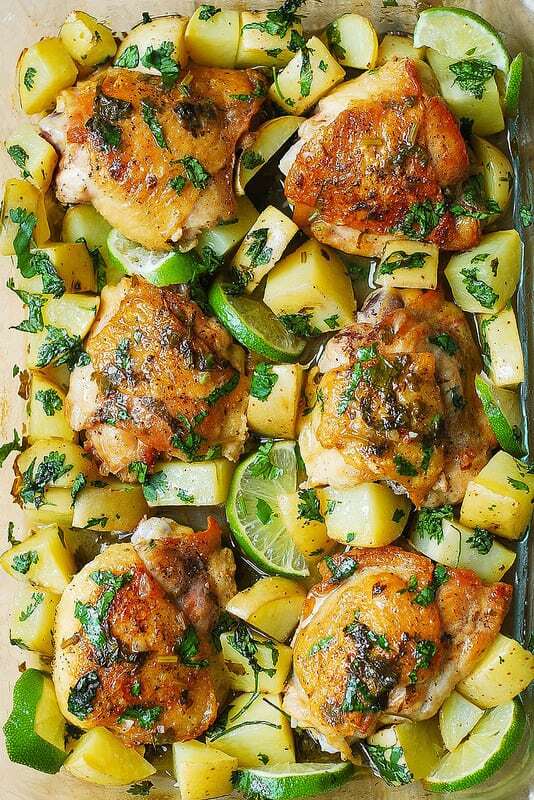 Add Summer breeze to your menu by baking these chicken thighs and sliced potatoes in a cilantro-lime, olive oil and garlic sauce. I’ve used yellow potatoes here but you can use any type: red, russet, other white potatoes. Keep in mind though that the russet potatoes might not hold their shape as good as the yellow or red ones. No matter what kind of potato you’re using make sure to chop them up into 1 or 2 inch chunks, not bigger than that. 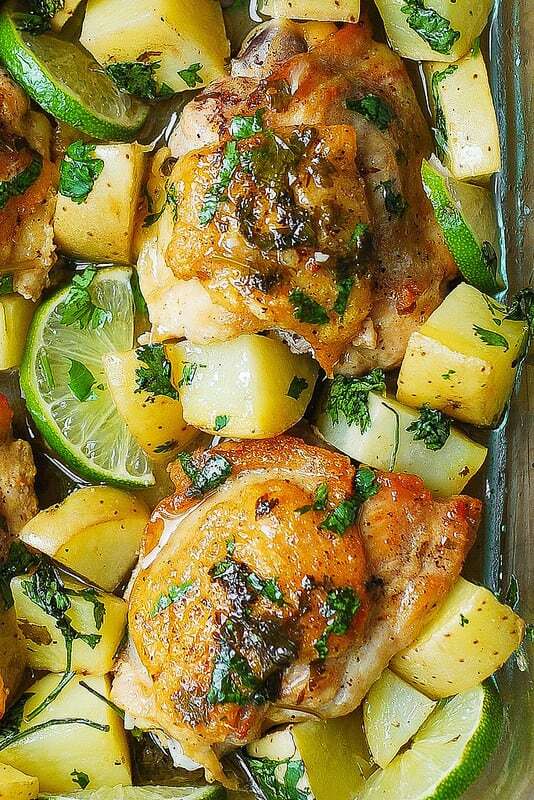 Cilantro-Lime Chicken Thighs and Potatoes baked in the oven in a flavorful sauce made with olive oil, garlic, cilantro and freshly squeezed lime juice! Perfect recipe for bone-in skin-on chicken thighs. Generously season both sides of chicken thighs with salt and pepper. Heat 2 tablespoons olive oil in a large frying pan over medium-high heat. Add the the chicken thighs, skin side down, and cook the chicken, on medium-high heat, for about 5 minutes, until the skin is crisp. Flip the chicken thighs over to the other side, turn off the heat and let the chicken brown on the other side, off heat, uncovered. In the mean time, dice the potatoes into 1 inch chunks. Place in a medium bowl. Add 1/4 teaspoon salt, half of the chopped cilantro, 2 tablespoons olive oil, and 1 tablespoon lime juice to the bowl with potatoes and mix everything well. In a small bowl, combine chicken broth, 2 tablespoons lime juice, the remaining half of the chopped cilantro, minced garlic and mix. Add this liquid mixture to the bottom of the 9 x 13 baking pan. Add chicken thighs on top, skin side up. 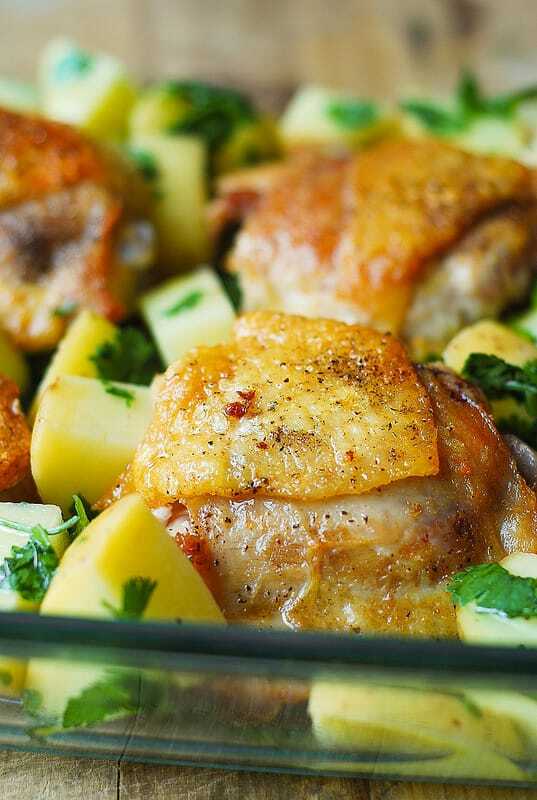 Place the potatoes around the chicken. Bake the chicken in the oven, uncovered, at 400 F for about 40 minutes or until the potatoes and the chicken thighs are cooked through. Remove from the oven. Using a large spoon, mix everything in the baking pan together, spooning the sauce from the bottom on top of the chicken thighs and potatoes. Before serving, top with a small amount of chopped fresh cilantro.